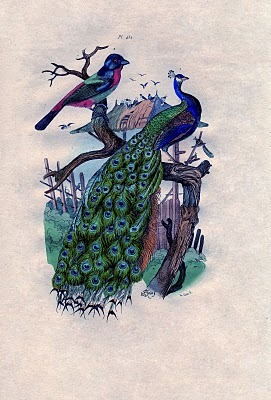 This is a gorgeous circa 1835 Paris print of a Peacock!! 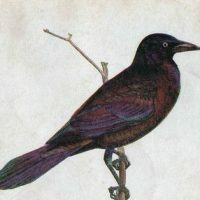 The original print includes a scene of a colorful bird, and a structure in the distance. You can print this one right out and frame it for some beautiful instant art! 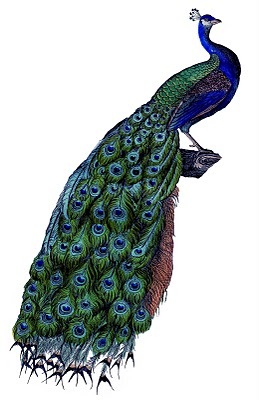 I’ve also included a second version with just the Peacock, for your art or collage projects. So colorful!!! 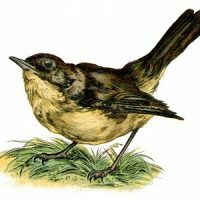 Vintage Crow Like Bird Vintage Clip Art – Sweet Nightingale Bird Vintage Horse Diseases Diagram – Unusual! beautiful images, as always! – thankyou for such an amazing website!! I do have a little request however; I have been searching for ages for a cowboy badge/star with flourishes – with no luck… And the other thing was cherry blossom trees? Would be so grateful for anything..
this is stunning – thanks Karen! Thank you so much. THis is gorgeous! I looove peacocks, but then I started to think about how it is that the industry gets their feathers and the research results were awful…like fur farms. But these prints are a nice alternative to having their beautiful plumage as design! Such a keeper. So beautiful. This is a really lovely image, thank you for sharing it. Beautiful peacock – thank you! Hi can I please use your artwork for a little project work. I love your work. It must be fun to search through all this vintage stuff and come up with such beautiful treasures. I am working on a few projects right now but not much survives sending from my iPad to the tower to the printer. By survival, I mean flipping. The Word flipper does not recognize the text box as an object and won’t flip horizontally and the printer isn’t responding to flipping OR resizing . Spent 2 full days on this now. Tired. Must. Rest. And try again.